Kedar shares the teachings of Sri Chinmoy with interested seekers and disciples from around the world. Each Monday at 8:30 pm CET / 7:30 GMT / 2:30 pm EST he will recite texts and poems for half an hour. 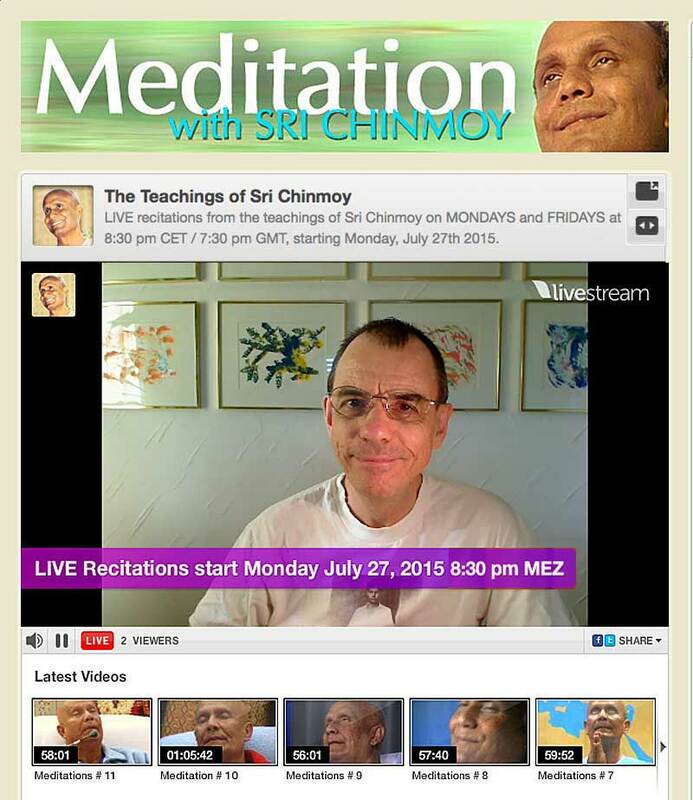 The recitations can be watched LIVE on original.livestream.com/srichinmoy and are available for some time online on-demand if you missed a broadcast. On the same livestream channel, there are also more than 10 hours of meditation videos that can be watched in a random order or selective in the on-demand section. 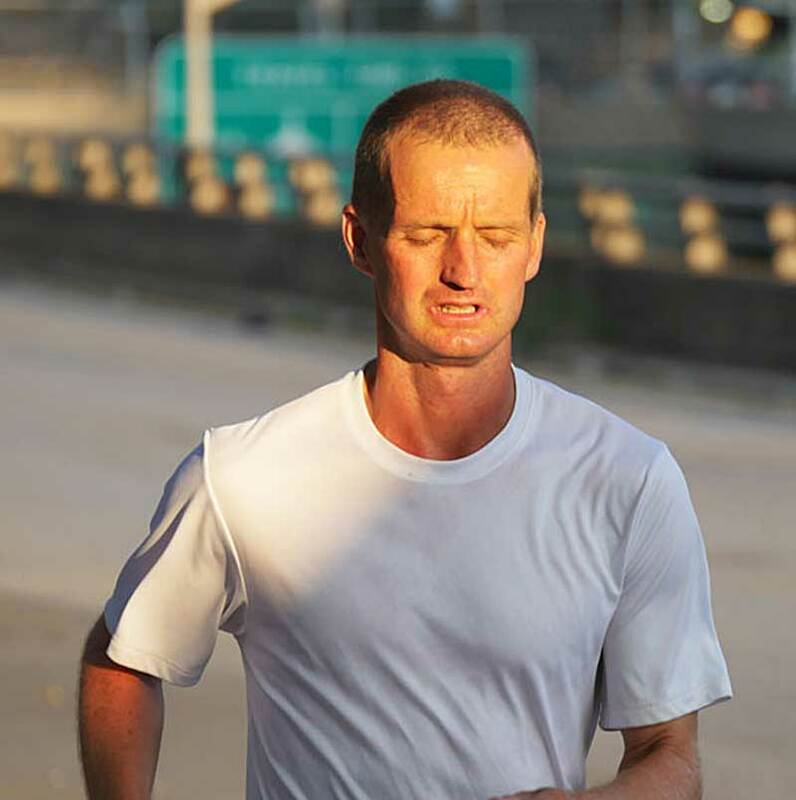 As mentioned on this site Ashprihanal Aalto set a new record for the Self-Transcendence 3100 Mile race. The flying Finn completed the epic journey in 40 days, 9 hours, and 6 seconds. This meant averaging over 76 miles a day (123.5 km). Utpal Marshall who has covered the race since the start, produced this short video which includes footage from the race, interviews with Ashprihanal, and interviews with other runners who talk about the inspiration they received from Ashprihanal. 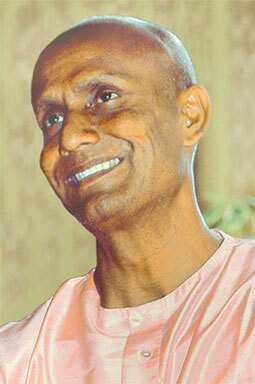 Ashprihanal has now completed the race, founded by Sri Chinmoy, 13 times. Video by Utpal Marhsall, Perfection Journey. Kedar Misani, a disciple of Sri Chinmoy for more than 35 years, is inspired to share the teachings of Sri Chinmoy in a new format with interested seekers and disciples from around the world. Each Monday and Friday at 8:30 pm CET / 7:30 GMT / 2:30 pm EST he will recite texts and poems for half an hour, the first time on July 27th. 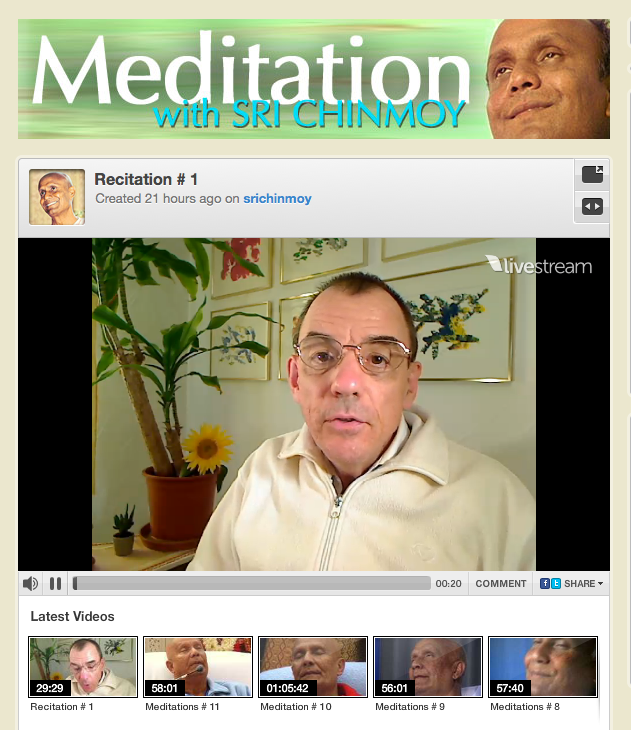 The recitations can be watched LIVE on original.livestream.com/srichinmoy and are available for some time online on-demand if you missed a broadcast. On the same livestream channel, there are also more than 10 hours of meditation videos that can be watched in a random order or selective in the on-demand section. In order to carry his mantric utterances home to the soul, Sri Chinmoy has explored most of the poetic forms that exist in English literature. Basing his oeuvre on the single, highly compacted stanzaic unit, he spans the full gamut of man’s communicative choices: aphorism, prayer, question, lyric, hymn, invocation, equation, definition, conversation, commandment and riddle. Ultimately, his is a microcosmic form of poetry. Each unit is structurally complete and independent of its neighbours. Its appearance on the page — so brief that the reader may take it in at a single glance — permits us to grasp the totality of individual poems in a way that is not possible with more extended works. The compression of Sri Chinmoy’s seer-vision within the microcosmic stanzaic form creates what might have been thought impossible in the English language — the effect of word-shrines. These are not born of the poet’s struggle with language but of his victorious acceptance of it. If its powers have waned, he wakes them by using them with a greater dignity than they had previously known; if its words are limited, he gives them new resonance by calling on them to help him approach the highest summits of spiritual vision; where there is power, he preserves it; where there is energy, he harnesses it. All that was immature and undeveloped in the vocabulary of the inner life has now become mature and fully developed. In the poems of Sri Chinmoy the English language achieves at last its true spiritual potential. 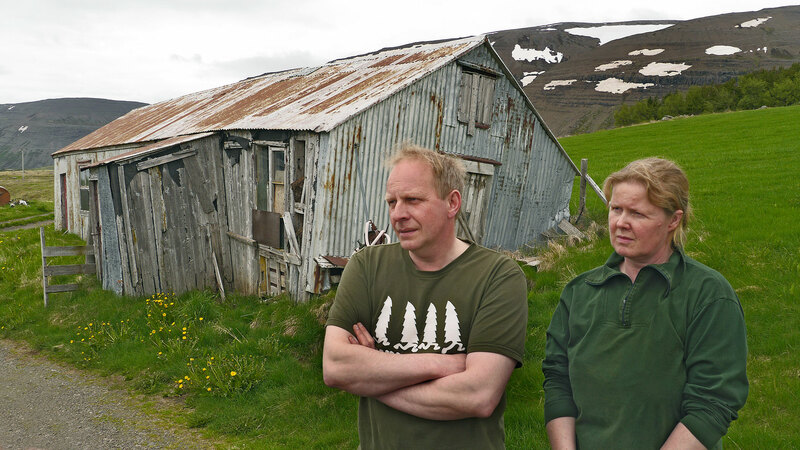 From July 1 -24, 2015, the runners of the Sri Chinmy Oneness-Home Peace Run, will cover most of Iceland. 12 international runners carry the peace torch to many muncipalities, to meet kids and grown-ups alike to inspire them to seek peace within themselves. 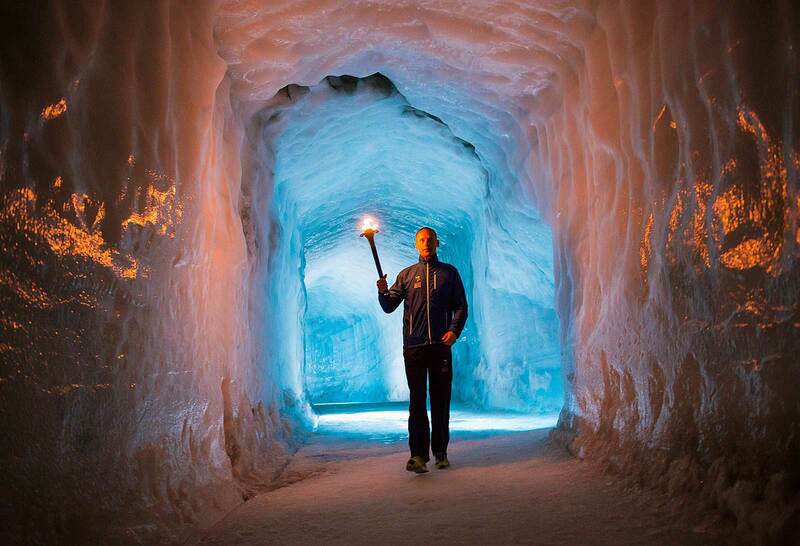 The peace torch was also recently inside the Langjökull ice-cave (see picture). The torch was lit inside the famous ice-cave and then the first symbolic steps were taken in the ice tunnels and on the Langjökull glacier. After that the runners were driven in special snow-trucks down to the start of the glacier where they started the run to Reykjavik City. 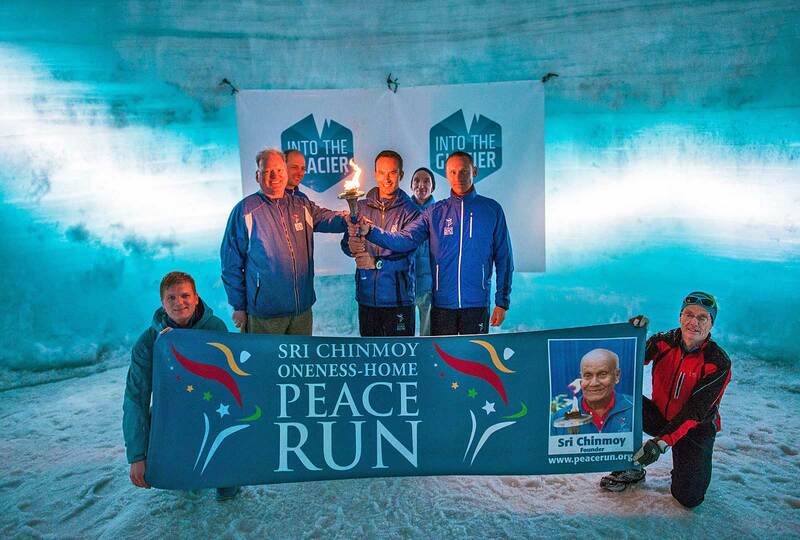 The organizers of the peace run chose this location because they felt it represents the uniqeness of Iceland and are resounding the words of Sri Chinmoy that Iceland is a pioneer in peace initiatives both with their peace inside the heart of the nation and the peace in nature. By the way, everybody is welcome to join the run. The moment you think of your old age, you destroy all your inspiration, aspiration, joy and enthusiasm. The moment you think of your old age, that very moment is your death. You have to feel that everything is a series of experiences. Do not take life and death as two separate things: this is life, that is death — no! Death is just a passage we are going through. There is life, and on the way we meet death. In the Eternal Life, there is life, then death, then again life. It is a game that is going on. Do not think of your old age. Think of your life as a road that is twenty-six miles long — a marathon — and then divide it into four or five stages. In the beginning, say for twenty years, you were learning and learning and learning. Then, in the second stage, you were learning and at the same time you were sharing your wisdom. Now you are in the third or fourth stage. So you have to see what you could do at the age of twenty, what you could do at the age of fifty and what you can do at the age of sixty. Do not think that what you did at the age of twenty is infinitely more important than what you are doing at the age of sixty. When you were twenty years old, God experienced Himself in and through you as a great student. Then He experienced Himself as a budding professor. When you turned forty, God experienced something totally different in and through you. At the age of sixty, He is experiencing something else again. It is a game. At this moment, God is playing a particular role in and through you. In a few years, in the same Cosmic Play, He can play another role. After another twenty years, He can play yet another role. We make a serious mistake by feeling that when we are fifty or sixty the role that God is playing through us is sometimes not as important as the role that He gave us to play at the age of twenty. We have to feel that whatever role God plays through us at the age of twenty, forty or sixty is equally important. For Him, sixty is not old age. After the age of eighty or even one hundred, when you go away to the other world, you will see that there He is still playing His role inside your soul. Now we always see the physical. We talk about our physical age, but the truth is that the moment we take a physical body, death becomes an inevitability. We may die tomorrow or the day after tomorrow. Again, inside the body, if you can be in touch with the soul, then you can take the body as a toy. You are playing with the toy, and then afterwards you are finished with the toy. This is always how it should be. 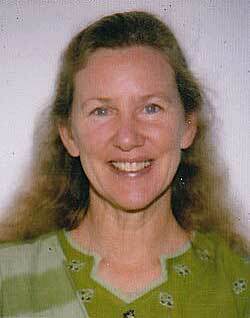 You are at the age of sixty, but you have to forget about being sixty. You are playing a new role; you have got a new task. How much are you ready to pray and meditate and lead the spiritual life? Do not think of all the mistakes that you have made as mistakes as such, but think that you have played a certain role and now it is over. If you start thinking of all your past mistakes, then it will only be an added burden for you. Instead just say, “I went there, and I had an experience.” Now wisdom has to come to the fore, and you will not do the same thing again because you did not find your goal inside those experiences. Now that you are sixty, only think of spreading your wings. You are already flying, but you have to spread your wings. How? By loving God and serving Him inside mankind. You should not say, “I am old. I do not have the capacity I used to have.” Instead you should say, “God does not want me to have my former capacity because God does not want to play that role in me any more. Now He wants me to dive deep within, as deep as possible. He wants me to have inner experiences to share with mankind.” Is that not infinitely more important than what you did in your youth? Again, everything has its own importance. The experiences that God gave you at the age of twenty or forty are also valuable. If a child does not have enthusiasm at the age of four or five, then will he get it at the age of fifty or sixty? Even if he gets it, it will not be the same because it is not coming slowly from a tender age. All of a sudden the tree is looking nice but while the tree was growing, when it was a tender plant, it did not look nice at all. So, every phase of life is equally important because our good qualities must develop slowly, slowly, slowly. If the seed does not germinate and become a tender plant, how can it become a huge banyan tree? Similarly, how can we think of becoming one with God if we have not prayed and meditated for many years? Before we took human incarnation, we were one with God. But He made us a tiny drop. Then He told us to expand, expand, expand and become the ocean. It is a continuous growth, a continuous expansion. The mind is never to be used at any time. If the mind is used, then you are finished. When you are ten years old, the mind will make you feel that you are as old as ninety years! Only think that at this particular stage of life you are supposed to do something. Then after ten or fifteen years you are supposed to do something else. Continuously a new game is starting, a new part you have to play. Each time you are given a new role, you have to play it well. When you become a huge tree, at that time more responsibility comes. A tree has to give so much, so much. Under the tree at first only one pilgrim can stay. Later many individuals can come and stay. Finally, the tree has to feel the responsibility of giving shade, protection and shelter to all. The higher you go, the more shelter, protection and illumination you have to give to others. In terms of human age, you may be only sixty or seventy, but in terms of divine light and divine wisdom you will become hundreds and hundreds of years old. When it is a matter of light, there are no earthly years involved. Light, delight, peace and so on do not belong to an earthly calendar. They came from Infinity, they remain in Infinity and they will always remain in Infinity. We have to consciously try to grow into that Infinity. Our life-river is flowing, flowing, flowing and entering into the ocean. Do not take the life-river as something that can be divided into years. It is a oneness-flow that is going towards the infinite Light. The important thing is not to use the mind when age is descending upon you. Only use the heart. Just say, “At this point I have to blossom in this way; at that time I had to blossom in a different way. A few years from now I will have to blossom in a totally different way.” Each moment has its own most significant beauty. When the time comes, when your life-flower is fully blossomed, then it will be able to give much more joy and fragrance to mankind and be of more help to sincerely aspiring seekers. – Sri Chinmoy, from “Wings of Joy”, first published by Fireside, NY, 1997. Meditation is invocation. We invoke God’s Presence. God’s Presence is satisfaction. Meditation is an act of inner listening. We listen to the dictates of God. When we listen soulfully, devotedly, unreservedly and unconditionally, we derive satisfaction in boundless measure. Meditation is acceptance. It is the acceptance of life within us, without us and all around us. 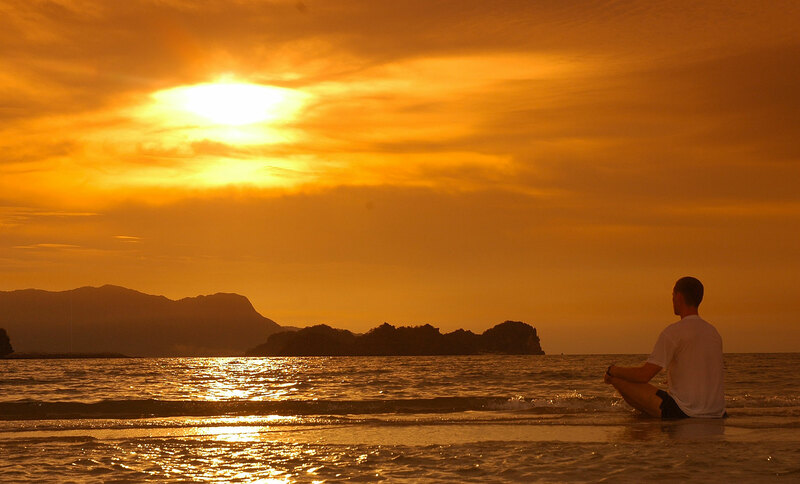 Acceptance of life is the beginning of human satisfaction. Transformation of life is the culmination of divine satisfaction. Meditation is self-giving. We give what we have and what we are. To the finite reality we give what we have. To the infinite Reality we give what we are. What we have is concern. This concern we offer to the finite. What we are is willingness. This willingness we offer to the infinite. Assurance we offer to the earth reality. Acknowledgement we offer to the Heaven-Reality. To the earth-reality we offer our constant assurance that we are undoubtedly and unmistakably for the earth-reality, for the transformation and illumination of the earth-reality. To the Heaven-Reality we offer our most sincere acknowledgement of the supreme fact that we are of the Heaven-Reality, that our source is the Heaven-Reality. Meditation and prayer are two aspects of one and the same soulful reality. The Eastern world is fond of meditation. The Western world is fond of prayer. Both prayer and meditation lead us to the selfsame goal. Meditation and prayer are like brother and sister; they are divine twins. We can say that prayer is the female and meditation is the male. Prayer says to meditation, “Look, brother, there is something high above. Let us cry and fly, fly and cry, and there above we shall get everything that we have been longing for.” Meditation says to prayer, “Look, sister, there is something deep within us. Let us dive deep within and we are sure to get everything that we have been longing for from time immemorial. Let us dive deep within. Sri Krishna meditated. His meditation-power has taught us many things. But the most important thing it has taught us is this: Truth will ultimately prevail; the justice-light of Truth will one day inundate the entire earth-consciousness. Lord Buddha meditated. His meditation has taught us that this human life of suffering will, without fail, one day come to an end. The excruciating pangs that each human being undergoes will one day come to an end, and human suffering will be transformed into divine ecstasy. The Saviour Christ prayed. His prayer has taught us many sublime, soulful and fruitful lessons. It has offered us the message of divinity in its tangible form. But his most essential teaching is that the Kingdom of Heaven is within us. This Kingdom of Heaven is God’s creation, God’s Vision and God’s Reality. God’s transcendental Vision and God’s universal Reality are within this Kingdom of Heaven. Let us meditate devotedly, soulfully, unreservedly and unconditionally. From our meditation we shall discover the supreme truth that as we need God, even so God needs us. We need Him constantly to reach our own highest height. He needs us constantly to manifest His own deepest depth. 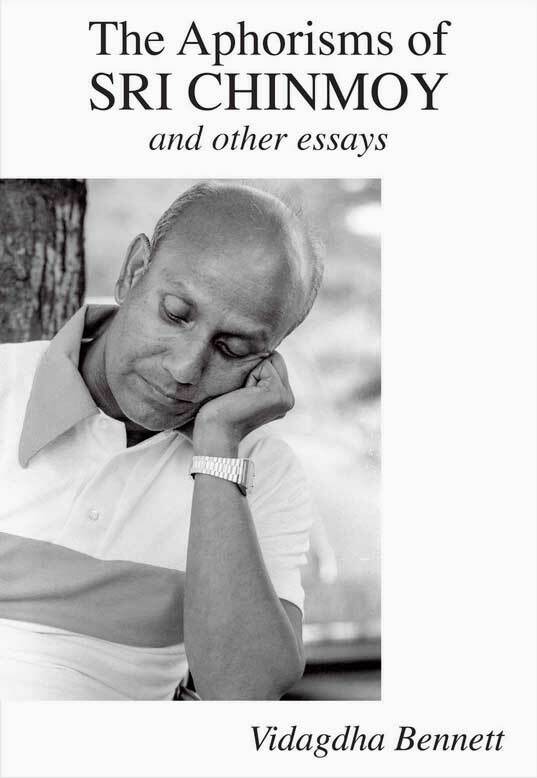 Sri Chinmoy gave this talk at the State University of New York at Stony Brook, on 16 February 1977, published in Sri Chinmoy, A seeker is a singer, Agni Press, 1987.